Great for Time Share and Condominiums. *** Please allow 5-14 days for delivery. CAN BE SOONER! 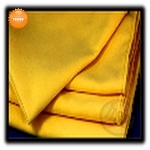 Microfiber Suede Weave Finish Polishing Towels, 14x14" Yellow. Price each, Sold by the Dozen. ** USUALLY SHIPPED IN 5-14 DAYS. CAN BE SOONER! Free Shipping.